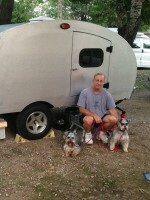 My husband and I are new to the world of travel trailers, although we are not new to building things. 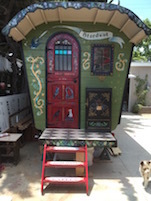 A couple of years ago online, I saw an intriguing "gypsy" camper that was a reworking of a small older travel trailer, and thought it would be a fun project -- my daughter ended up getting one for a hundred bucks and we helped her fix it up. But I wasn't sure about having one of our own until we spent all last year and this spring visiting the National Parks in the west. 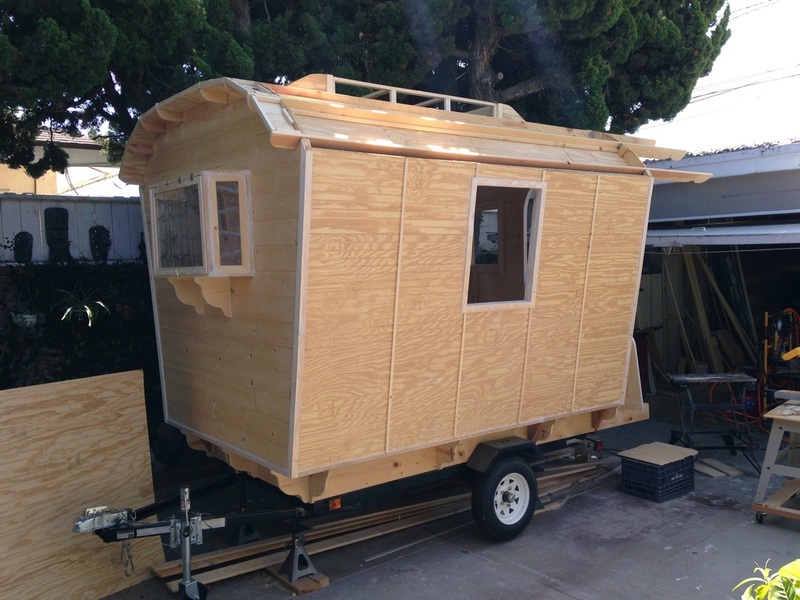 After our trip to Yosemite this spring, we decided we'd buy a small older travel trailer and fix it up for ourselves. My husband suggested, "why not just build one ourselves?" and I nixed that idea. 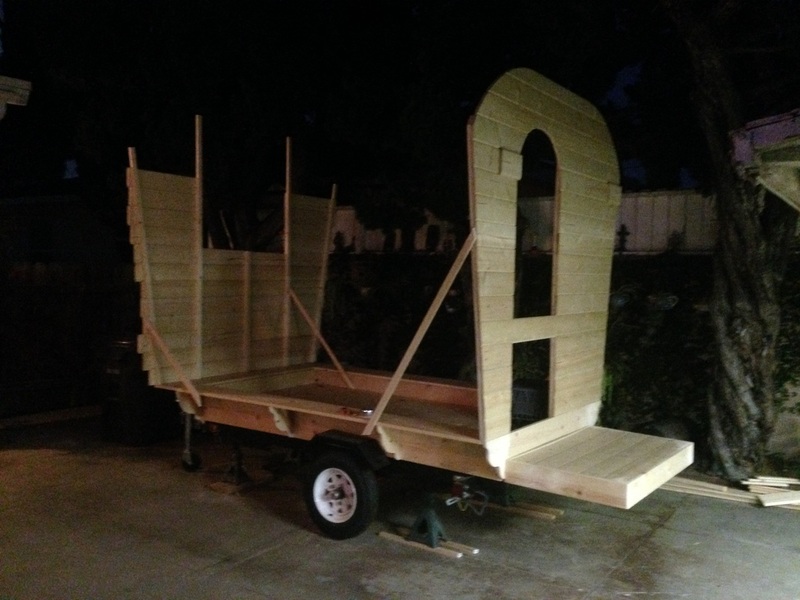 Until I couldn't sleep one night, surfed the web and ran across this and other sites for do-it-yourself trailers and by the time he woke up later in the morning, I had all kinds of plans for us. 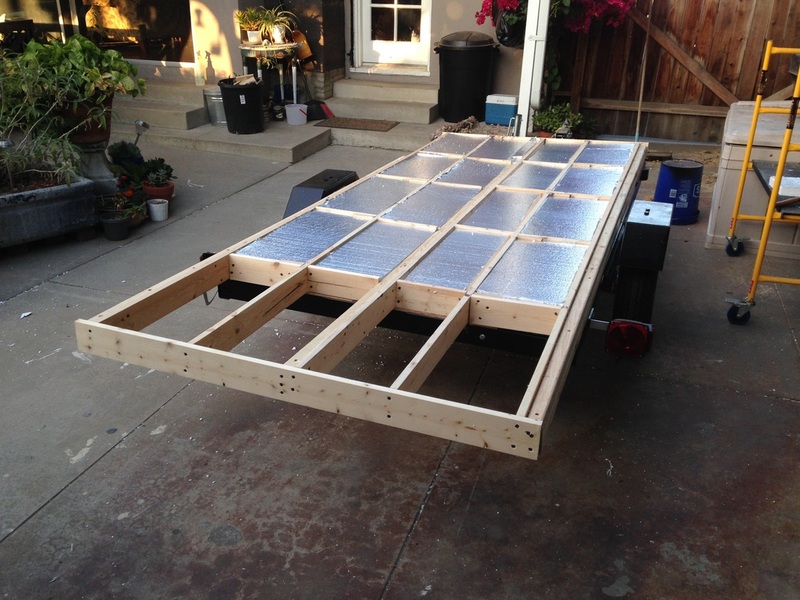 Then we topped that off with two sheets of 3/8 plywood, glued together to strengthen the floor. Then I left for a month to teach out of state. My husband is waiting for back surgery, so it takes both of us to do anything! When I got back this week, we proceeded to build the box, the back wall and the deck, and we are halfway through getting the front wall up. The back will have a bay window, and the sides will have stained glass windows -- I ordered a couple of panels on wayfair.com and they should be in this week, so we can build the frames out to know the sizes. 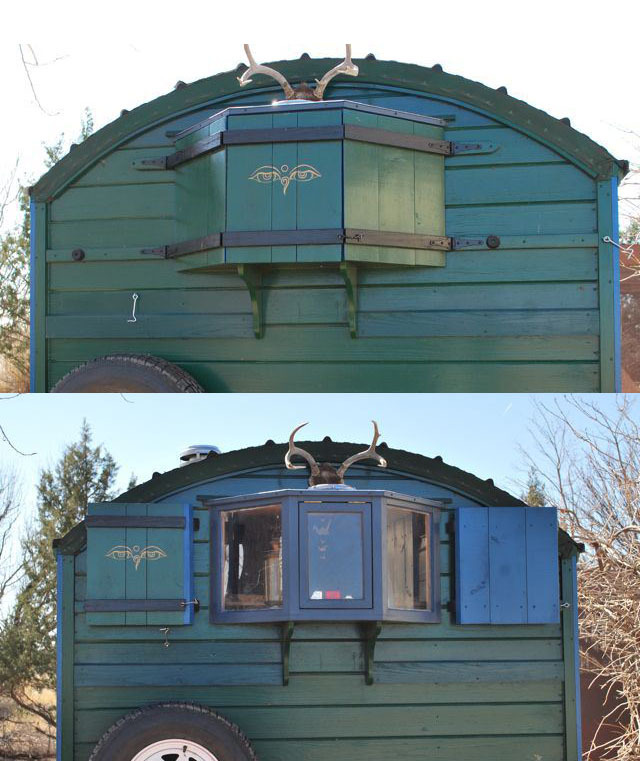 This little vardo is going to be completely over the top, decor wise. I'm an artist and I want the whole thing painted with some rather elaborate designs. When we work together, my husband Dale is the basic construction guy, and I do the finish work. We've remodeled and sold 3 houses and have skills and experience to handle making pretty much anything. 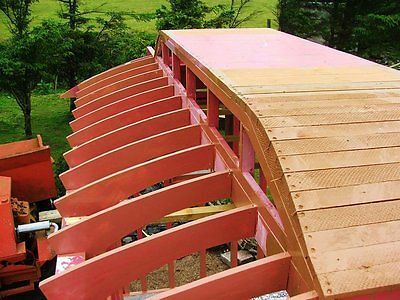 We left a 2' wide section across the top of the roof flat so we wouldn't have to try to integrate a curve - and, I like the ends curved and the top flat. Nice job so far. I've always liked the look of Vardos so will be watching. We're much happier with this. We finished the ends, notching both ends to accept the rafters, and then we rounded off the rafter tails. Not sure if we're going to add another one in the gap where the mollycroft will be. We can make that decision later. 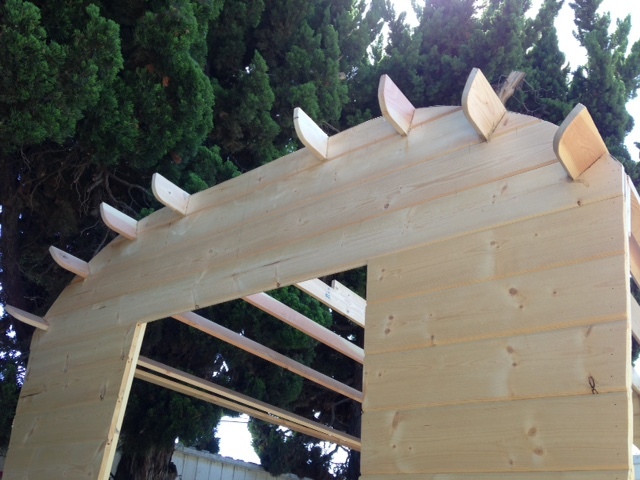 We set the rafters in and began to frame in the sides before it got dark. Not sure how these will function yet, but I'm leaning towards having the large center one open on a top hinge and leaving the two side panels stationary. Before putting them in the sash, I added an acrylic panel that will protect the outside, and left the beveled side inwards. 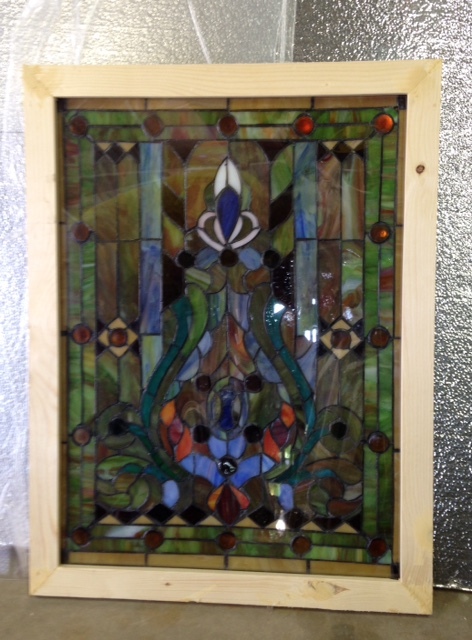 I also purchased two stained glass panels from wayfair.com - about $110 each. Quality is average, but this will do for our windows. 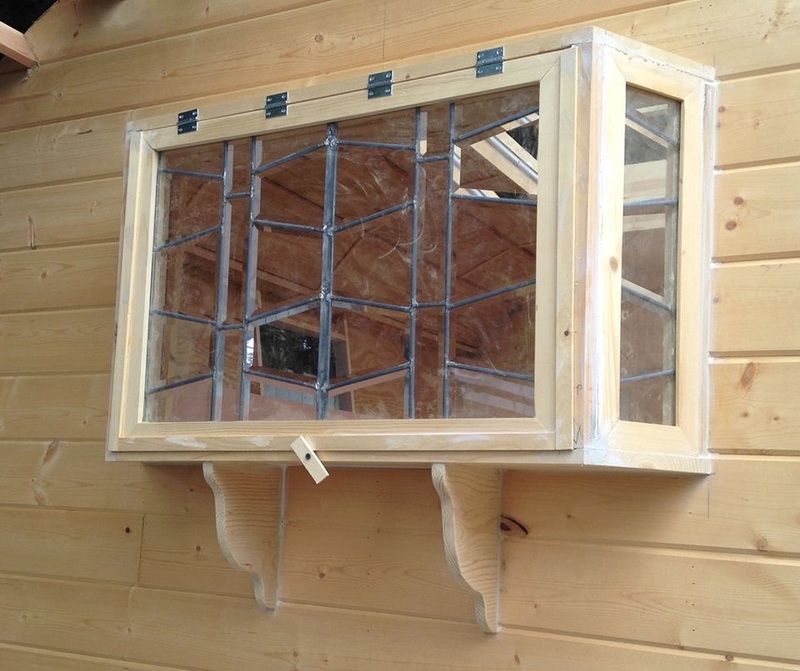 Again, put a layer of acrylic plexi on the outside when putting them in the sash. They're about 18 x 24 inches each. These will be hinged on top and we'll put one on each side of the wagon. 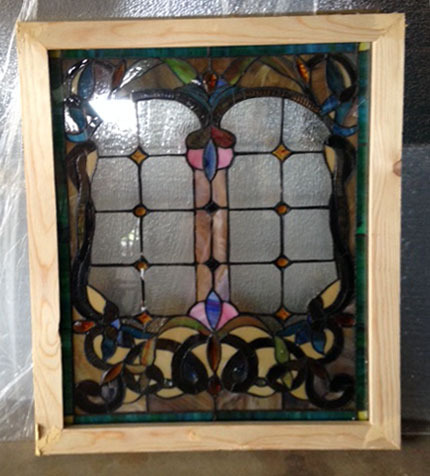 I've still got a little bit of my leaded glass panel left, I may make that into something for the front door, and we've got room on the side with the door to add yet another little window, so I'm keeping my eye out for something to add there. I still need to sand down these last two. The sashes will be painted. So that's where we are. We are hoping to put skin on the sides this week. 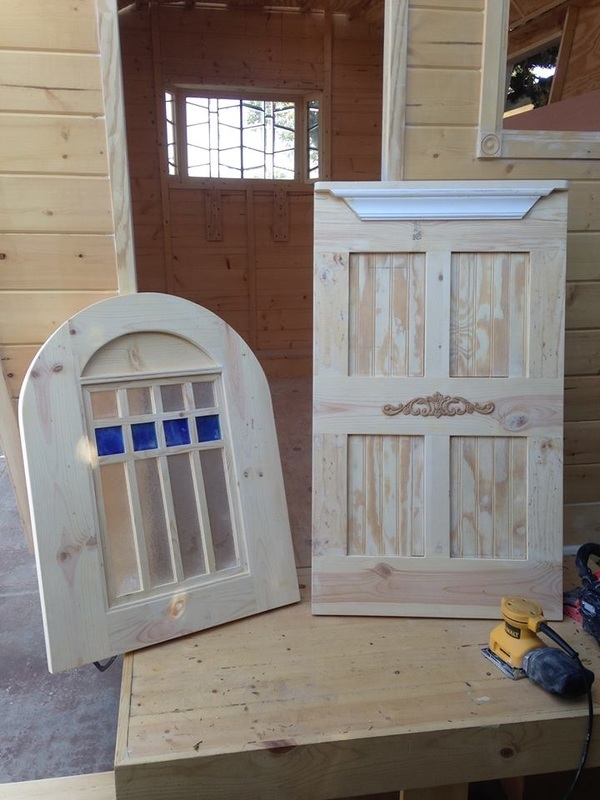 While my husband does the major construction, I do the small detail jobs -- so I'll get working on a dutch door. Looking good so far! Which way do you have the bed going? What are the measurements? Looks huge. ...but it does look very tall yet narrow at the base. With a lot of roof framing in the trolley top it might get a little top heavy, relatively speaking, and would be one to watch out for tipping in high winds... especially with the out slopping walls acting like scoops, or pockets, for the wind... making a slight up lifting vector compared to a flat wall. Add to that the overhanging eaves and the trolley top to catch more wind up high. Just saying, something to be concerned about that you may not have considered. The wind acting on a large surface area can have a very forceful effect, and the taller the surface the more leverage that force imposes; narrower the footprint the less resistance to the leverage, and then you have the "perfect storm", or compiling of conditions that allow bad things to happen "unexpectedly". It is not all doom and gloom, just something to consider and be mindful of, especially if you will be traveling in wide open spaces where strong winds are more common, like out west where all the good parks are. Did you say, is it 4 wide or 5? We're planning on the bed at the tongue end - it'll be across the width and will pull out across rails to accommodate a queen sized mattress (folded in half when not in use). Underneath will be storage, drawers, etc. and a pullout table top. 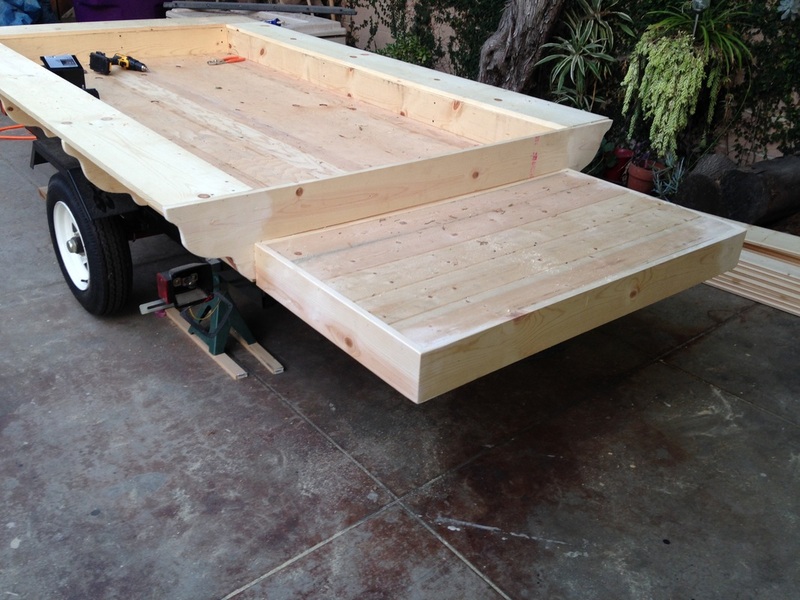 The measurements are 4 x 8 on the trailer with a 10" high, 10" wide ledge, so just under 6' wide at base, angled to be 7' at widest point (about a 9 degree angle outward). The highest point is 7' off the trailer (9' from ground). For roofing, we are looking at using the titebond/canvas method, adding rigid foam insulation between the rafters and then putting in a thin plywood ceiling at the bottom of the rafters. That brings the interior down to about 6' 8", which is about right for my rather tall husband. 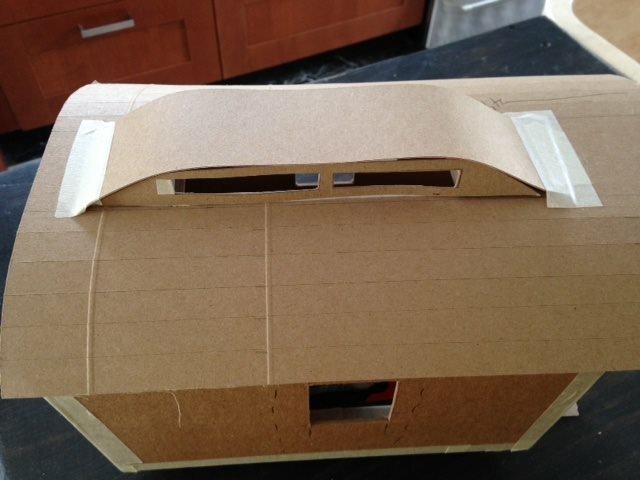 We do want to keep it light at the top, that's been a concern for sure -- we were just talking last night about how we are going to handle the roof overhang on each side - wanting to keep it minimal for drag, but still wanting it to shed water properly. I'm also working out a lightweight plan for the mollycroft framing - the pictures I posted in the top post certainly looked heavy relative to what we're working on - it'll likely be skinned over framing of 1 x lumber before waterproofing. I'm also using lexan windows up there to save on weight. thanks for the feedback! we appreciate the points to consider! 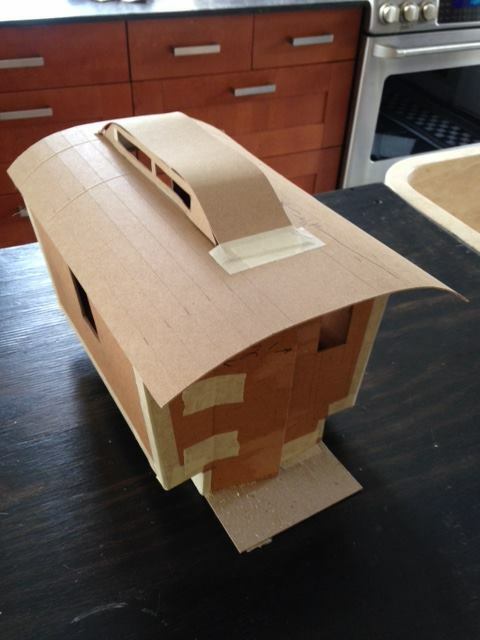 We're working on figuring out our roof, but I got most of the bow window put up yesterday. You can also see that we started putting in the ceiling with the leftover pieces from the side panels. I also need to finish framing out the doorframe and get it sanded so I know my final door size. 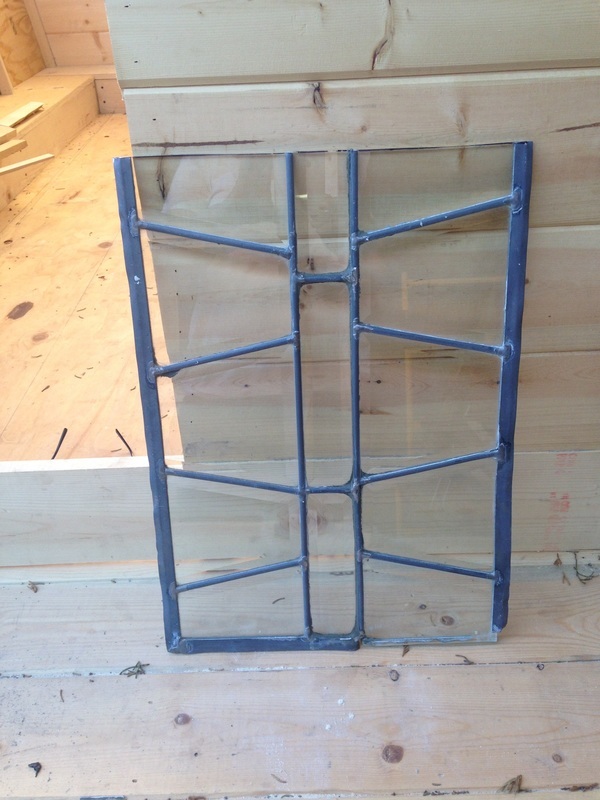 I picked up some colored and patterned glass for the top half of what will be a dutch door. We also picked up the supplies to work on the roof, so we'll be working on that this week! I've started a new semester at school (I teach), so work had to slow down a bit, even at our slow pace. 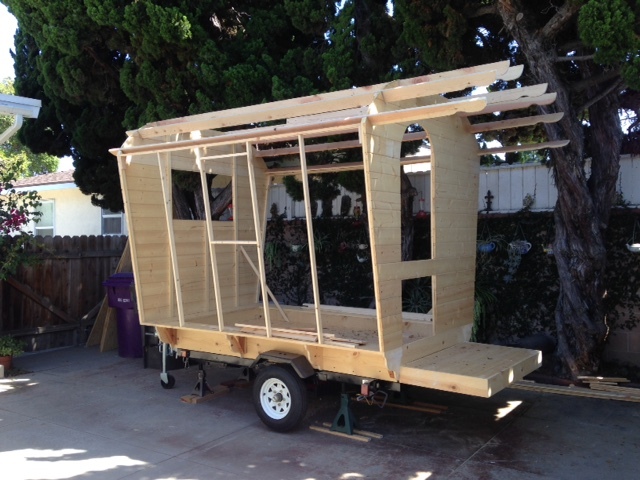 I did get some work done on the exterior, mostly getting openings and trim around the edges done. So, first, I got the door frame trimmed out. Used 1/4" plywood, so I could get the arch put together without as much piecing as using dimensional lumber (which I've been cutting down to 3/8" thick). 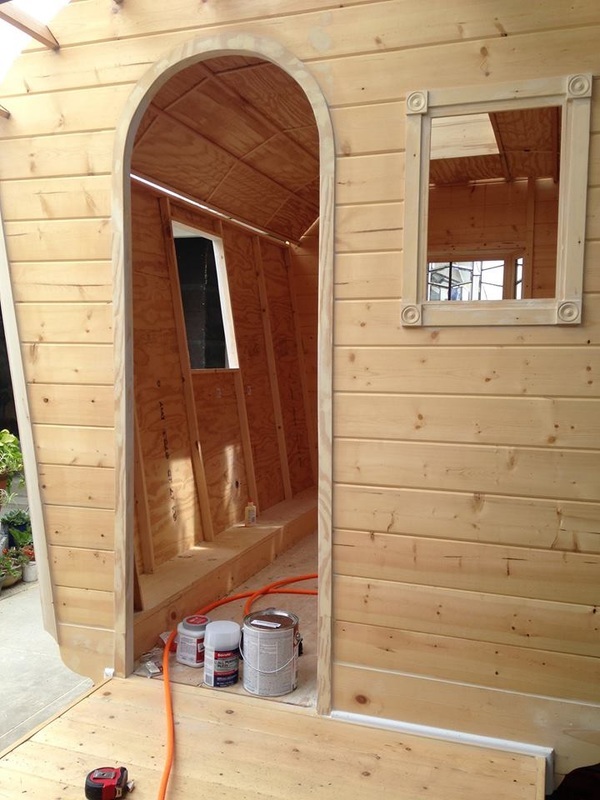 I also put trim around the window openings, filled any gaps with bondo, then sanded smooth. 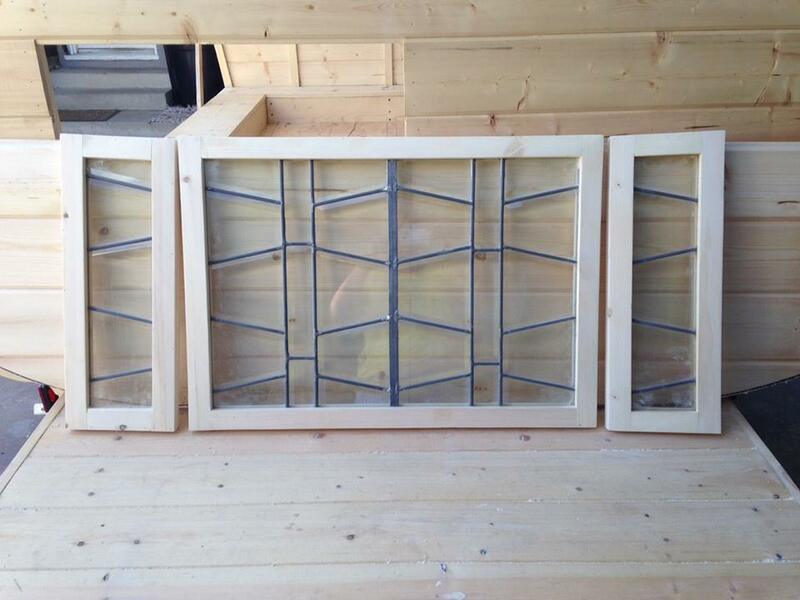 So the side window openings are ready to install the stained glass panels. 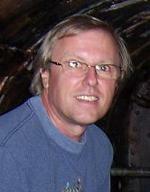 Did the same around the arched door opening. It's these little things that take so much time. I also added trim around the four corners, and all along the bottom edges of the body, and vertical strips to trim out the body. You can also see in that picture the framing for the mollycroft, which stands 6" above the roof. It still needs a roof, but we had to get some scaffolding so we can reach the top. We didn't have any ladders tall enough to work comfortably up that high. You can also see that we set a ceiling in. We will get to the insulation this weekend, and hopefully get a skin over the top. I added in blocking for the bay window end, have to get that done today for the overhang over the door. I also have the upper side trim for the roof cut, but need to get that sanded before I put it up. I also made the dutch door. 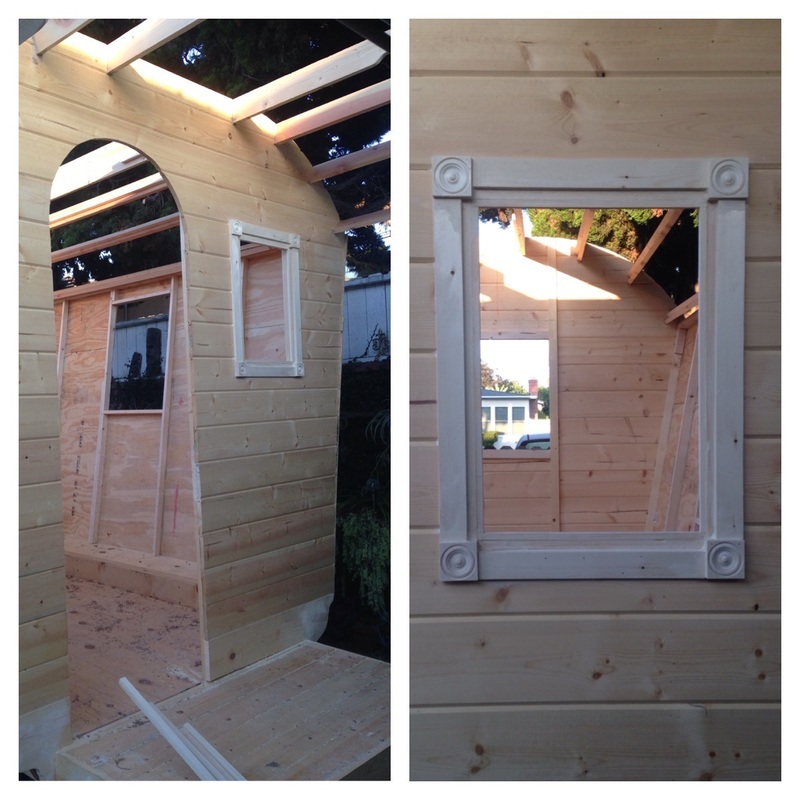 Started by building the lower half with dimensional lumber, adding some trim pieces leftover from other projects. This will be painted, so paint grade is fine. Fitted that, trimmed and sanded that (still need to caulk), and then built the top half of the door. 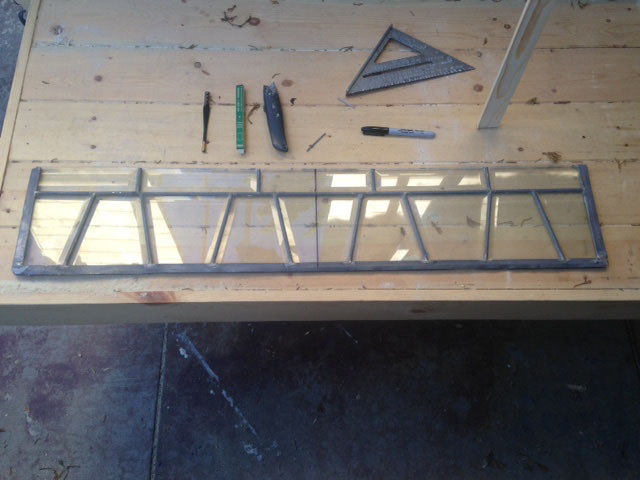 I started that by building a window, cutting stained glass into strips and making slotted trim to put that all together. 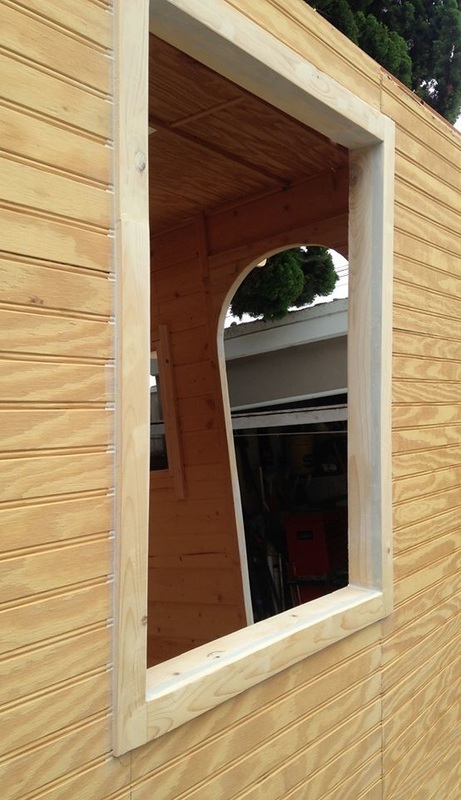 After I built the window, I built the door around it by overlapping dimensional lumber cut to fit. got that all glued up, sanded, and ready to hang and paint. In that arch space, I'll be putting in a mosaic. 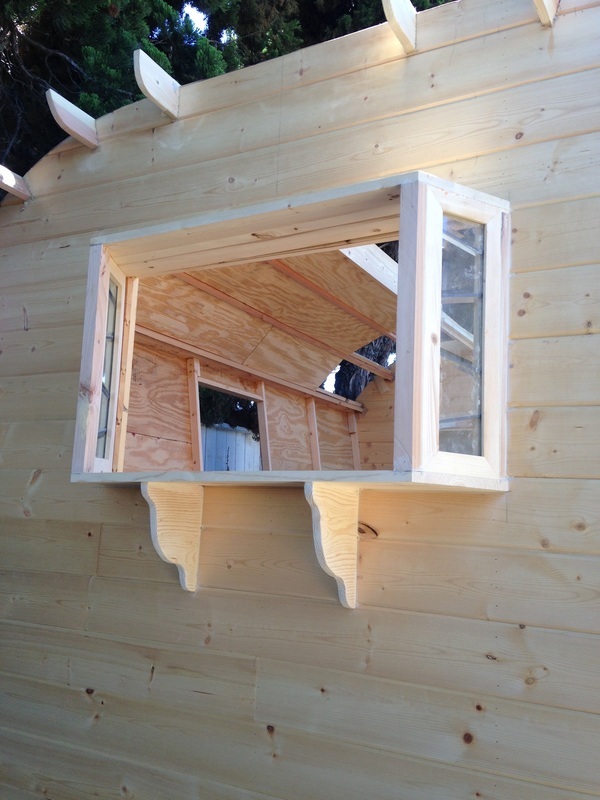 And finally, got the back bay window installed. I still need to install some hardware to keep it closed, but for now I have a little toggle to hold it snug. A little dusty, and I'm less than thrilled with the way the hinges look right now, but they'll get painted along with the trim, so hopefully they blend in. 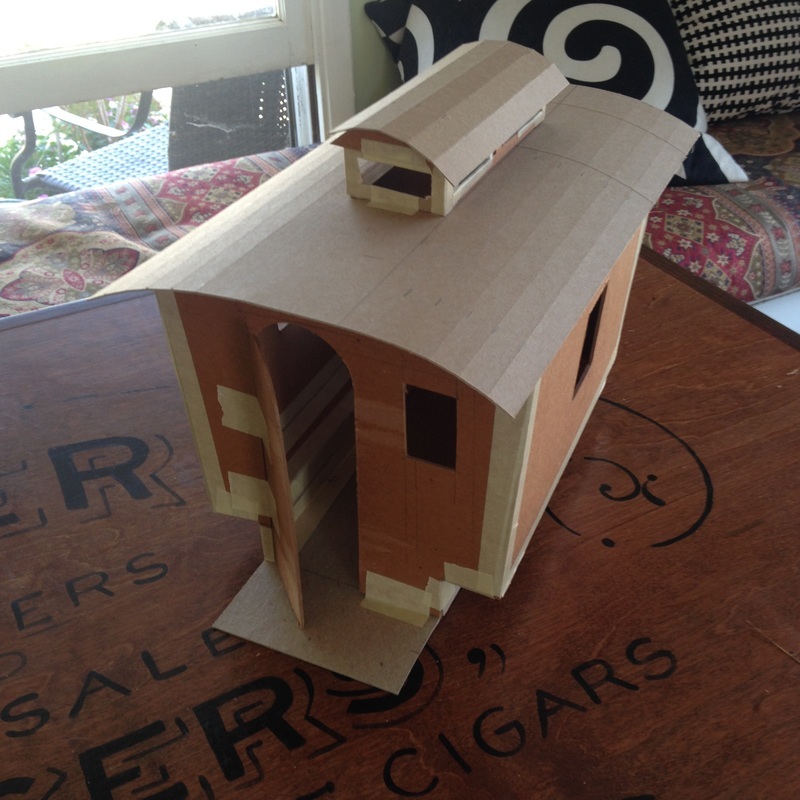 Still have some sanding and small trim to do around here, and I'm not sure if I'm going to put a small roof on it. We'll see how that goes. So....progress, but still a long ways to go! Looking good youve done some tidy carpentry there. If i may be so bold as to offer some advice... i would be inclined to rebate the hinges into the window frame and edge of the sash. It will look far better and should give last longer. You can now get easy fit hinges where one leaf fits into the other eliminating the need to mortise the hinges. You have done a lot of work adding quirky little details. And boy does it show. That is going to be one good looking rig. I can't wait to see how you finish painting it. So far you are setting the bar pretty high for the rest of us.